The Prime Spot Self Catering is situated in the charming town of Worcester, in the spectacular Breede River Valley. The accommodation comprises of two self-catering cottages, of which the Kothuis duplex cottage has two en-suite bedrooms, a lounge with a fireplace and a sleeper couch, a dining room, a well-equipped kitchen, and braai facilities; and the Tuishuis cottage has one en-suite bedroom, a lounge, and a kitchen. 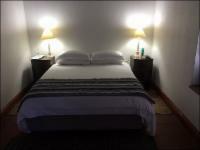 The lodging also offers guests DStv, laundry services, and parking on the premises. Worcester has an abundance of great attractions in and around the area, including the Karoo Desert National Botanical Garden, the Kleinplasie Worcester Open Air Museum, and the Worcester Wine Estates. A lovely comfortable place to stay - a home away from home. Everything you could possibly wish for away from home. Lovely generous touches of sherry and firewood to build an indoor fire. Super friendly staff. The Prime Spot Self Catering is 0.5km from the centre of Worcester , the nearest airport 101.2km (Cape Town International Airport).